A piping hot bowl of soup is the ultimate comfort food during the winter. I have tried out a few new recipes this winter and this is one of them, Green pea soup with the addition of celery and mint is so delicious. The consistency of this soup is usually thicker and it is nice and filling. You may replace the celery with leek also. 1. Heat olive oil or butter in a pan and saute the onion. 2. Add the celery, green peas and mint leaves. 3. Add 5 cups of water, a little salt and bring to a boil. 4. Simmer until the vegetables are cooked and tender. 5. Allow it to cool and blend using a hand blender to a smooth paste. 6. Add water or milk and adjust the consistency of the soup to your linking. 7. Add the freshly ground pepper and stir in the cream. Garnish with cream and mint leaves. Thanks Moumita.. I am sure you will like it. What a lovely combination peas and mint. It has a nice vibrant colour too , looks delicious. 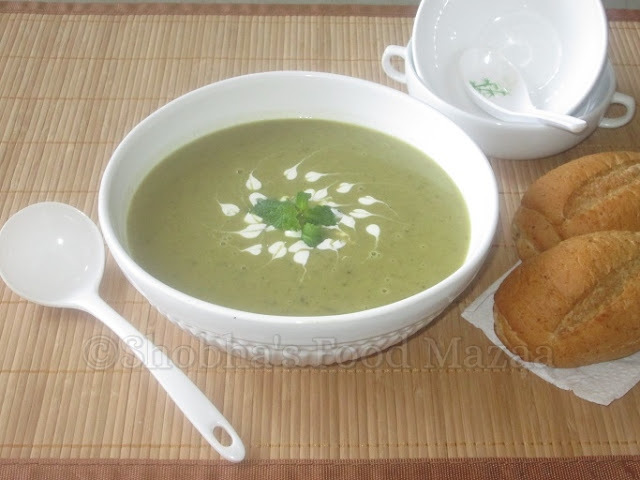 Healthy, comforting and delicious soup for the winters.. 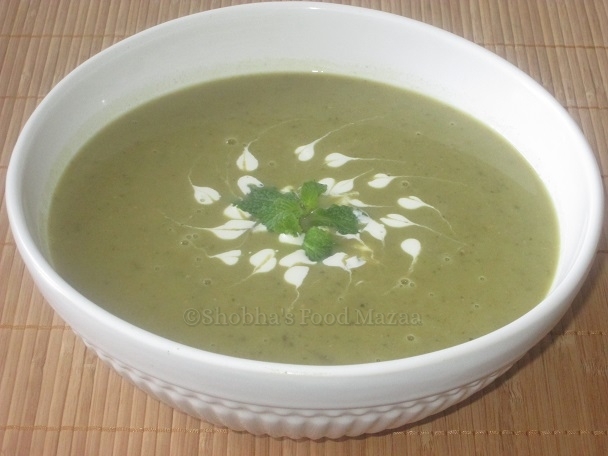 I love pea soup but have never tried it with mint. Certainly sounds good! I am not a soup fan but my family is. It sounds so comforting and delicious. Totally the ultimate comfort food. For me it's like a balm to de stress with after a tiring day at work. I am in love with the flavours going on in this soup. Simply yummm. Bookmarked and must try. Pea soup is one of my favourites and your addition of celery sounds like a good one. I am not a huge fan of pea soup but I should try it with mint. I love mint so it may make me change my mind. Thank you for sharing the recipe. Love those cute little white hearts. I love this idea!! I am such a fan of mint and struggle to find ways for it to be a star in recipes.. this is such a great recipe for soup!!! Yes, mint is so flavourful.. love it too..